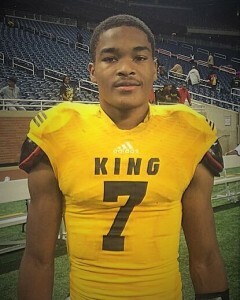 King High quarterback Armani Posey, who passed for 208 yards and three touchdowns to lead the Crusaders’ 27-25 victory against Cass Tech in the Detroit Public School League Division 1 Football championship game, has been named PSL Proud Strong Learner of the Week. Inserted as the starting quarterback in Week 4, Posey, who is also a standout linebacker, was at his athletic best last Friday before a PSL championship record crowd of about 11,000 at Ford Field. The 6-1, 200-pound senior eluded Cass Tech’s defensive pressure and utilized his team’s wealth of offensive weapons to help the Crusaders emerge on top after a back and forth thriller. Posey had a 17-yard touchdown pass to Dontre Boyd in the back of the end zone with 7:42 left in the first half and the two connected again on a 3-yard TD pass just before halftime. For his third TD, Posey lofted a perfect floater to LaVert Hill, who ran most of the 85-yard scoring play to put King on top early in the third quarter. After entering the season with little fanfare, Posey is finally attracting major college recruiting attention that’s commensurate with being the offensive trigger of the state’s No. 1-ranked team. He’s also one of the Crusaders’ top defensive players.